When Giotto—considered the first artist of the Renaissance—painted this fresco at the Basilica of San Francesco d'Assisi in 1290, he hid something in plain view. It took 721 years and some close up photographies for someone to see it. 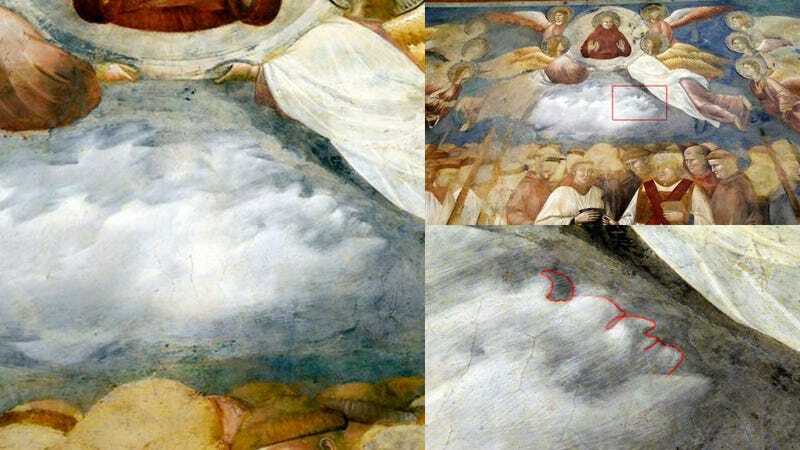 It's the devil—the face of a demon with black horns hidden in the clouds showing the heaven, just below two angels and San Francesco himself. It was discovered by medievalist Chiara Frugone while inspecting some close up photographies of the basilica's frescos. The basilica was restored after a major earthquake in September 1997, which completely destroyed other parts of the Franciscan buildings in Assisi. According to the historians, this is the first occurrence of a painter hiding something in the clouds. Sergio Fusetti, the basilica's chief restorer, said that it was probably a prank following a fight between Giotto and someone else. The painter may have decided to paint the profile of this person as the devil, immortalizing him forever without anyone really knowing about it.